The singular Michael Garrett ploughs his own furrow. He was born in Leicestershire in 1944. By 1961 he had begun to study with Rubbra, later still studying composition with Alfred Nieman. He also had Frank Merrick as a teacher; Merrick being an esteemed pupil of Leschetitzky who left behind a fascinating corpus of recordings from Field to Bax and all manner of interesting stops in-between - and indeed beyond. Displaying considerable variety Garrett also managed to record an LP in Paris in 1969 with that most eloquent and lyrical of Jazz trumpeters, Bill Coleman; it’s still available, on Jazzology. Later still he was music director of the Lindsay Kemp Mime Company and wrote film music, prominently for Ken Russell’s Women in Love. He now works full time on composition. If his portrait photograph is representative he’s also something of a natty dresser. He has a considerable number of works to his name but this disc concentrates exclusively on those for piano, and on the purely tonal side of things. Aux pas I dates from the very early 1980s and is cast in folk-like guise, albeit the melodies are Garrett’s own. There’s a fusing of Scotch-snap and Jazz in the first, whilst the second is jam-packed with incident and at one point chinoiserie seems to infiltrate the sound-world. We get three of the cycle of twelve; the eleventh is effusively romantic, with pretty tunes and a sense of breathless rapidity. Garrett likes the Prelude. There are twelve in the second set of Aux pas, and we hear considerably more - though not all - of this set. Of especial note are the puckish wit of the first, the exuberant snap of the third, and the jubilant dance that is the fifth. There’s plenty of right hand filigree in the thirteenth which is programmed ahead of the tenth. In all we get eight of the twelve. The third set was composed much later, in 1997. There are twenty-four and five are programmed here. Some interesting harmonies spice the first in D minor, whilst the second has clearly absorbed the freedoms that jazz offers amidst the sense of wistful songfulness. The stomping left hand in the B major [No.4] doesn’t sound Boogie-esque but is maybe a reminder of the carousing, wandering rhythmic kick that jazz players employ. The Two Preludes are very brief; the second is delightfully frisky. They’re the most recent works in the set, dating from 2007. The Book of Circe was written between 1968 and 1976 and consists of 100 pieces in 10 books. This is a multi-stylistic work and we hear, extracted from it, a suite ‘In the Old Style’ and some other smaller, similarly evocative pieces. These are really lively, delightful miniatures, and they evoke baroque procedure wittily. Maybe there are some hints of Poulenc. We end with the Valse de salon, which he wrote for Women in Love in 1968, rich in parlour and show-song hues. 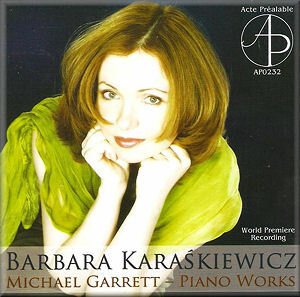 The intrepid Barbara Karaskiewicz plays these works with technical assurance, rhythmic vivacity and command. She differentiates and characterises finely. She’s even added ornaments - with the composer’s agreement, doubtless - in some of the Circe movements. This is the first CD devoted to Garrett. His piano music here is tonal, lyric, vital and wistful, drawing from baroque dance patterns, the natural world, the energising kick of jazz, and the precision and clarity of French models. It can also teem with incident – sometimes even a little too much - and offers a welcome breath of sincere, dogma-free generosity of spirit.